Please call with any questions. If you need help finding a room we can try to help you with that as well. BOOK or CANCEL AT LEAST 48 HOURS IN ADVANCE by Calling. You will receive a Credit with Fun Brothers for up to 6 months for the amount paid, less a 10% booking fee. •Fun Brothers is not responsible for delays, personal circumstances, or problems with transportation that may affect my ability to arrive on time for my scheduled tour. Fun Brothers will NOT hold up a Bio Bay Tour for late arrivals. 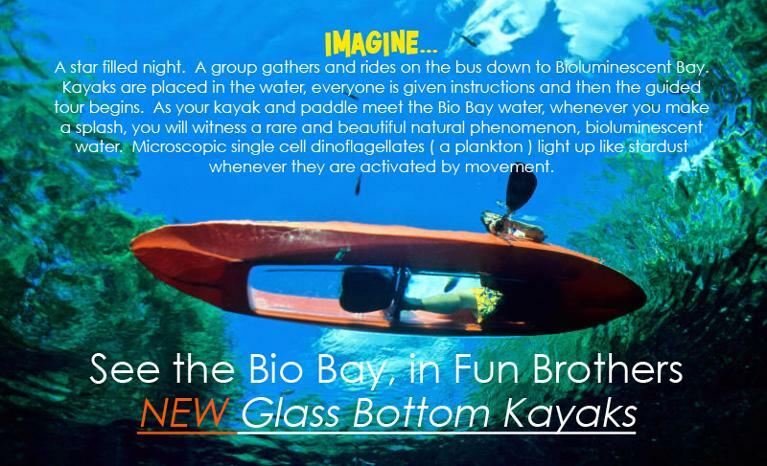 Reservations accepted for Bio Bay tours. No Full moon tours are scheduled. Give us a call with any questions and make reservations for any night. Fun Brothers are happy to help you enjoy Vieques! Looking for a GREAT place to stay for an overnight or extended visit...you can't beat Trade Winds in Vieques, PR. Visit their site for more info and photos.